Biography of David McCallum by CL Crouch Find out what David's up to! David Keith McCallum's vitals can be listed in a single page (and in fact are, in Lynda Mendoza's "The McCallum Observer", a fine quarterly newszine devoted to the Scottish actor), though his credits -- even in small type -- run on for several pages, since he's contributed to so many of the artistic media. You can find the titles of all or most of all of them in the Internet Movie Database. But the skimpy facts don't begin to portray the profound effect he's had on millions of his fans, as well as, peripherally, modern cultural attitudes generally. There are those who can make the case for that seemingly grandiose claim far better than I, but just for now, ponder this: you can travel from the U.S. to Australia and find people who've become fans of his because of just one of the television series in which he's starred, "The Man From U.N.C.L.E.," and who will vouch for his having influenced their life choices, even though most were merely children when they first viewed the series. But famous as it is, let's not dwell on that one series; Mr. McCallum has had a finger in virtually every performing arts pie that exists. They include: playing several instruments, conducting an orchestra, key roles in major films (for just one example: he won out over several envious peers for the role of Judas in "The Greatest Story Ever Told"), reading books on tape, singing, recording music he's composed (and even played), voice-overs for various commercials and various documentaries, a mini-series ("Mother Love"), several television series as well as guest starring on other series, at least one quiz show which required acting ("Cluedo," a British version of the board game Clue), legitimate theatre, and even a new CD-ROM! But this is getting ahead of things, so let's back up to where it all started when he arrived September 19th, 1933, in Glasgow, Scotland, the second son of David McCallum, Sr., a violinist, and Dorothy Dorman, a cellist, whose first son was named Iain. A few years later, the family moved to London, where both sons attended private (in Britain they're called "public") schools, and his father became concert master of the London Philharmonic. McCallum junior inherited his parents' talents, and was greatly encouraged by them to follow in their footsteps. McCallum senior, especially thought his son would become well-known in the music world, as he had, and in fact, David did learn the oboe and, as he put it, "(blew) my way through several symphonies before I decided that I didn't want to become a musician." Despite that statement, he certainly has left his mark on the music world with his recordings and compositions! As a boy, he was reputedly very shy (and still is, if recent reports from his fans can be considered confirmation), and read incessantly from any books he could get, but especially from the classics, Chaucer, Kipling, Dickens, Shakespeare, et al. Perhaps it was the last who inspired him to become an actor later on, but even as a boy, to express himself, he would play-act among family members, where he felt comfortable. He even spent time as a teen playing summer stock. Before choosing acting as his mainstay career, he spent part of the early 50's with the Royal West African Frontier Force on the African Gold Coast, where he became an expert in explosives and small arms, which must certainly have lent credibility to the many roles he played which required that very expertise. While Mr. McCallum has played many roles, it would be farcical to deny most fans above the age of thirty knew him first from his part in the mega-hit U.S. 60's television spy series, "The Man From U.N.C.L.E." 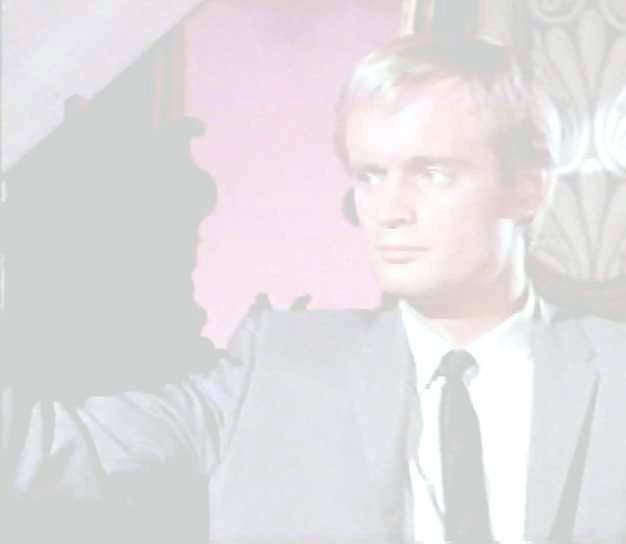 As Illya Nickovetch Kuryakin, the cunning, mysterious, and sometimes acerbic, yet ultimately charming (at least to the female contingent of his audience) spy, Mr. McCallum drew forth from the sketchily-outlined role a character so vital that thirty years later, some people still have trouble separating the sanguine actor from the dour Russian. The role of the Soviet secret agent working in the New York base of operations of the ultra-secretive agency, the United Network Command for Law and Enforcement, more familiarly known as U.N.C.L.E., has haunted Mr. McCallum almost to distraction, as well it might, since his vast body of other contributions deserves better than equal recognition, if for sheer volume alone! It is to that end, at least in part, that this site has been erected, in hopes that those who never saw what else he has done (and can do!) will seek out his other talents to enjoy! But before we leave his part in U.N.C.L.E., a few more words. Even knowing Mr. McCallum's deeply rooted reluctance to discuss the role, I have drawn it out for particular notice for two reasons. First because it's such a touchstone for his fans, and second (and more pertinent reason) because the series, as well as his role in it, were so widely influential. This is, in part, due to the nature of the decade. Someone once referred to "U.N.C.L.E." as a perfect time capsule for the 60's, which in turn, is universally recognized as a pivotal decade in the 20th century. "U.N.C.L.E." caught the fervor of change in styles, politics, personal mores and political attitudes in a way which, like "Star Trek", another quintessential 60's series, inspired young minds to challenge the status quo as never before. Coupled with the booming technology which threatened to wipe out mankind, the McCluhanistic concept that the medium was the message prompted the young fans of the series to take U.N.C.L.E's message to heart. That message, intended or not, was that we might actually be able to fend off our self-destruction if, as in the semi-serious "U.N.C.L.E.," we all worked together. Heady stuff. Mr. McCallum's role as the transplanted Russian, while almost an afterthought by the show's producers, became an obvious focal point of hope. "Look!" it seemed to say, "If a Russian, our greatest enemy (as the U.S. perceived the Soviets then), can work closely with and be completely trusted by Americans, perhaps anything's possible." Besides the altruistic nature of the show, however, it must admitted that there was nothing of the avuncular about McCallum's fans' deep feelings toward the "Russian," as his "drop-dead handsomeness," as one unbiased reporter in U.N.C.L.E. 's heyday described it, forced Mr. McCallum frequently to hide to avoid being torn to bits by over-affectionate mobs of female teen fans. His shyness made him a very private person, very humble, and thus he has never quite comprehended the effect which, to this day, he still has on those devoted fans. Those same fans are now married and have teens of their own, and have perhaps learned the value of discretion when around Mr. McCallum. But rest assured, even knowing the difference now between actor and his role has not dimmed their appreciation of his works or his personal charm one iota. Quite apart from that surge of teen hormones, his acting and his fusion of self into the role of Illya inspired a legion of young fans to, as adults, emulate that character's espousal of tolerance, quiet certitude, expertise in the sciences and desire for world peace. And since McCallum created the role virtually from nothing, that's a legacy of which he should be very proud. Having said all that, I maintain he has not been typecast, as evidenced by the great demand for his various skills and talents. If he's not known for his other talents, it's only by lazy reporters who haven't done their homework, or who refuse to acknowledge the dominant portion of his body of work in so many other arenas. One can only wonder at such bullheadedness. His fans have definitely gone out of the way to ferret out copies of his recordings, films, and so on, and now that he has this site on the Web, that number of knowlegable fans can only increase as more and more come to deeply appreciate him for things completely unrelated to "Illya Kuryakin." The man McCallum is "rather conservative" politically, sleeps little, is very thoughtful, and in fact said once he wishes sometimes he could turn off his "thinking machine," as his mind "never stops!" He's given to long walks, often at night, when he can be unbothered. He has been spotted reading and riding his bicycle, as he is a great believer in keeping fit. While not a strict vegetarian, he does eat little meat, and lean, at that. A love of cameras led him to process his own photography, which he confines to personal subjects, largely his own friends and family. He does play golf (he is after all, a full-blooded Scotsman!) and his newest obsession is computers, especially the Internet. He resides in New York, father of 4 grown children, with his wife Katherine, and he continues to grace the stage with his witty style and unique presence, to the delight of all fortunate enough to catch him in action.